Region 8-AAA: Sophomore Aaliyah Whiteside scored a game-high 27 points as top-seeded Central defeated Germantown, 67-57, in a Region 8-AAA quarterfinal. The Lady Warriors (23-3) will take on No. 2 seed Ridgeway (22-6), a 56-45 quarterfinal winner over Mitchell, in Monday's semifinals at Central. ... White Station (23-9) advanced to the 8-AAA semis with a 65-49 win over Southwind. Breanna Ridgell had 17 for No. 2 seed White Station. ... Overton beat Whitehaven, 65-29, in another quarterfinal. The Wolverines (27-2) will face White Station on Monday. Region 7-AAA: Arlington advanced to Monday's Region 7-AAA semis at Bolton with a 74-56 victory over Dyer County. 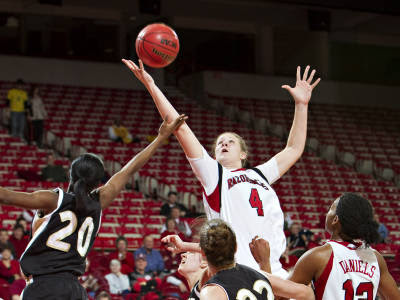 Camille Alberson's 24 points led the Tigers. ... Arlington (23-8) will take on top-seeded Jackson North Side, which ended Cordova's season with a 64-54 overtime win at home. ... Seniors Jasmine Newsome and Tamarah Brandon combined to score 26 points for top-seeded Millington (31-2) in a 47-26 quarterfinal victory over Munford. ... It took overtime, but Craigmont (15-13) won at Hardin County, 75-69, and will play Millington on Monday. Region 8-AA: Top-seeded Manassas ended Washington's season with a 59-41 victory. Jamille Reed's 13 points led three Lady Tigers (23-4) in double figures. ... Hillcrest edged Northside, 40-38, and will play Manassas in a Monday semifinal. ... Shervonte Bright's 17 points helped Trezevant rally to beat Sheffield, 50-48, and advance to the semis. ... The Bears (14-13) will play top-seeded Fairley, which knocked off Frayser, 73-30. Senior Erica Ousley had 18 for the Lady Bulldogs (27-3). Region 8-A: Top-seed Douglass was upset by Adamsville, 71-58. Junior guard Bianca Lee led the Lady Red Devils with 17 points. Other Memphis Class A teams also were eliminated as Scotts Hill beat MAHS, 69-31, Madison Academy beat Westwood, 75-48, and Middleton knocked off City University, 61-26. In a Division 2-A substate matchup pitting a pair of Miss Basketball finalists, it was a heady defensive play by Harding Academy sophomore reserve Ki'ana Christy that helped the host Lady Lions preserve a 52-49 victory over Nashville Davidson Academy on Friday and advance to next week's D2-A state tournament in Nashville. Christy's defensive pressure on DA guard Lindsey Seigenthaler with 18.9 seconds left induced a five-second call after the Bears had cut Harding's lead to three (52-49) on a Seigenthaler 3-pointer with 45.3 seconds left. "That was huge," said Christy's senior teammate, Alex Black, a 5-7 Chattanooga signee and D2-A Miss Basketball finalist who finished with a team-high 22 points for the Lady Lions (25-5). Though Harding would go on to miss the front end of a 1-and-1 with 15.2 seconds left, DA junior Alex Warfield, the Bears' Miss Basketball finalist, threw the ball away on DA's next possession, and Christy ran out the final ticks after taking the inbounds pass. "Ki'ana has been really good defensively for us all year," said Harding coach Becky Starks, whose Lady Lions advanced to state for a third straight season. "She's come up big and shut down some big-time players." Harding, the No. 1 seed from the West Region, led by as many 12 points (31-19) in the third quarter before fourth-seeded DA (23-4) came storming back on the inside play of 5-11 freshman post Faith LeGate. After a 1-of-6 start from the field in the first quarter, LeGate scored 23 of her game-high 25 points over the final three quarters, including 11 in the third to help slice Harding's lead to 38-33 after three. The Bears, though, never got closer than three points the rest of the way. Freshman guard Kaylah Keys had 12 points and senior post Christina Brown added eight for Harding. Warfield finished with 10 for DA while Seigenthaler had 11. Briarcrest Christian School punched its return ticket to the State Girls Division 2-AA semifinals Friday night with a 50-37 win over Brentwood Academy that they described as a team effort. And you have no idea how good it felt for the Saints (21-5) to collectively say that. "Really we didn't come together until the regional final (against St. Benedict)," said senior Anne Panagon, who had 12 points, including a coast-to-coast layup. Panagon then followed with two free throws that opened some space, 44-35, with 1:08 to play. "Until last week, it was everybody kind of thinking, 'I've got to do this' or 'I've got to do that,' " Panagon said. "Now, we're playing for each other, and trusting each other. It took a long time for it to come." Sophomore Dakota Doss, who wasn't eligible until early January, had six of her 12 points early, then hit 3-of-4 free throws in the final minute. Junior center Taylor Pugh added nine points, seven rebounds and did yeoman work against 6-2 Eagles' post Taylor Reece, who had 14 points. “She was the focus all night. My job was to stay behind her, and force them to go with other options,” said Pugh, who was munching on a piece of a giant celebratory cookie with her shooting hand wrapped in ice after the long night’s battle in the lane. Senior Amy Metcalfe, like Panagon playing her final home game, had 10 points, five assists and four steals. The bigger story was on defense as the Saints allowed the Eagles (16-13) just 13 second-half points. The Eagles' only other scorer was 5-3 freshman guard Brooke McFarland, who had 11 points, including 3-point shots at the end of the first and second quarter. The second cut the Saints' lead to 29-24 at the break. Reece then opened the third quarter with back-to-back shots to make it 29-28. "We didn't panic. Everyone just did their job," said Metcalfe, going to her third state semifinal after missing last year following a bitter homecourt quarterfinal loss to Baylor. "We've wanted this so bad." After Reece’s third-quarter mini-run, Briarcrest’s defense largely shut off the middle. The Saints also forced the Eagles into 20 turnovers, while giving up just 11. Smith said at times it’s been a struggle to re-form this unit around his two seniors. But the kids showed enough to let Panagon and Metcalfe have one more try at getting the Saints into a state championship game for the first time since 2006. BCS won four state titles from 1998-2004. “This is it for us. So this means everything,” Panagon said. St. Benedict welcomed Chattanooga Baylor to Memphis with an old-fashioned whipping Friday. The Red Raiders traveled 350 miles and six hours only to run into a strong Lady Eagles basketball squad. SBA improved to 25-5 with a 55-32 triumph over Baylor in the quarterfinals of the Division 2-AA state tournament. SBA advances to next Friday's state tournament at Lipscomb University in Nashville. "(Friday's) win verifies that we are not a flash-in-the-pan team; we have built a strong program that is emerging," said St. Benedict coach Don Sebren. "We are two wins away from the gold ball; a state championship. It will take everyone pulling together to reach our goals." Senior Allison Hotz said returning to state is a dream come true. "Advancing to state in back-to-back years is a great accomplishment," said Hotz, who snagged eight rebounds and played stingy defense. "Hopefully, after next weekend, we will be champs." Junior Kayley Coggin led the Lady Eagles with 12 points. Symone Daniels chipped in 10 points and grabbed 11 rebounds. Amber Howard's 12 points led Baylor. The Lady Eagles put on an offensive show in the first half, building a comfortable 22-3 cushion on a jumper by senior Elaina McCracken with 4:19 left. Julie Eckel sank one from the foul line to lift the hosts to a 29-13 advantage at intermission. SBA coasted in the second half, leading 44-23 after three quarters and continued to pour it on in the fourth. Region 8-AAA, 7 p.m. -- Whitehaven at Overton, Southwind at White Station, Germantown at Central, Mitchell at Ridgeway. Region 7-AAA, 7 p.m. -- Cordova at Jackson North Side, Dyer County at Arlington, Munford at Millington, Craigmont at Hardin County. Region 8-AA, 7 p.m. -- BTW at Manassas, Northside at Hillcrest, Frayser at Fairley, Sheffield at Trezevant. Region 8-A, 7 p.m. -- MAHS at Scotts Hill, Madison Academy at Westwood, Adamsville at Douglass, City University at Middleton. D2-AA state quarterfinals, 6 p.m. -- Chattanooga Baylor at St. Benedict. 7 p.m. -- Brentwood Academy at Briarcrest. D2-A sub-state, 6 p.m. -- Nashville Davidson Academy at Harding Academy, Fayette Academy at Knoxville Webb. 7 p.m. -- Franklin Road Academy at Lausanne. 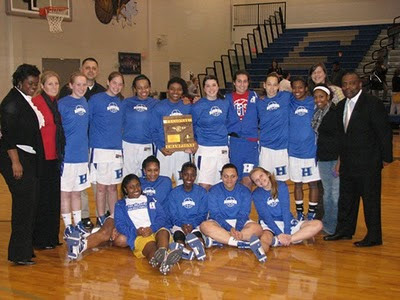 The Harding girls held off Lausanne, 45-41, to win the Division 2-A West Region girls tournament title. Alle Logan's 12 points led the Lions, and Christina Brown chipped in 10. Lausanne was led by Breana Williams' 12 points. Both teams will host sub-state games on Friday. The Overton girls needed overtime, but they pulled away from Ridgeway to win their second consecutive District 15-AAA title, 53-44, Wednesday night at Wooddale High School. Overton's Jasmine Robinson was named MVP of the tournament and teammates Karisma Tyson, Cornelia Fondren and Orlandria Williams were named to the all-tournament team. Tyson had a team-high 17 points, Robinson 15 and Fondren added 11. Ridgeway junior foward Hasina Muhammad's 3-pointer as time expired in regulation forced overtime. Ridgeway had trailed, 32-26, after three quarters, but outscored Overton, 15-9, in the fourth. Muhammad had a game-high 23 points. Muhammad, Adrian Sanders and Tequila Stanton were named all-tournament for Ridgeway. Overton hosts Whitehaven and Ridgeway plays at Mitchell on Friday in the first round of the Region 8-AAA tournament. Douglass beat Westwood, 68-58 in the girls title game. Manassas 74, Trezevant 71: Sophomore combo guard Denise Jackson scored a game-high 19 points to paced three starters in double figures before walking away with the tournament Most Valuable Player award as the Lady Tigers (24-4) won two of three meeting this year against the Lady Bears (13-13). Manassas, which plays Washington in the regional quarterfinals Friday at Sheffield, has won 13 of its last 14 games. It's hard to believe how focused and determined this young lady is...And she is only a junior in high school. However, at the end of this current school year, she will have a high school diploma as well as an associates degree, equivalent to two years of college credits. Not only that, last Monday Kayla Brewer gave her verbal commitment to the University of South Carolina and will begin college this coming fall. WOW!! As you see academically, she is focused and on a mission. But she is also on a mission athletically. Last spring, Kayla participated in the try out for the U16 national team and was not selected. So now she has renewed her training on the court, in the weight room and with a new diet. She fully intends on making the U17 team. Another year, another district tournament win, another 30-win season for the Millington girls basketball team — though the sigh and shake of the head from coach Stan Gatlin would tell you the degree of difficulty hasn’t gotten lower. “It doesn’t seem to come easy for us, but we get it done,” said Gatlin, after the Trojans (30-2) had to stage a late rally for a 49-43 win over Arlington (25-7) and its raucous home crowd in Tuesday’s District 14-AAA tournament final. In the consolation game Craigmont (14-13) rolled to a big first-half lead, then held off Cordova (20-8) for the 45-41 upset. Top seed Central whipped White Station, 72-45, in the girls championship game. Freshman Nina Davis led the Lady Warriors with 24 points, and tournament MVP Aaliyah Whiteside, a sophomore, added 18. Central will host Germantown on Friday in the first-round of the Region 8-AAA tournament, White Station will host Southwind. Lausanne trailed by seven at the end of the first quarter, but behind 20 points from Damion Wooten and 17 from Marquentin Brown, the Lynx rolled over St. George's, 66-40, to capture the region title. Both teams will host sub-state games on Saturday. ... In the boys consolation game, ECS beat USJ, 76-37. Behind 28 points from LeDarius Davis, 25 from Marcus Guy and 20 from Darrius White, fourth seed Overton clobbered third seed Germantown, 104-77, in the boys consolation game. ... Southwind edged Germantown, 67-65, in the girls consolation game. Erica Turner led Southwind with 16 points. Shad Grandberry scored 13 points to help Trezevant win the boys consolation game over Northside, 43-32. ... The Northside girls won the girls consolation game, defeating Frayser, 58-42. The Fairley girls won the district title over Hillcrest, 56-40. The top-seeded Lady Bulldogs were led by tournament MVP Erica Ousley's 27 points. ... University of Memphis signee Chris Crawford earned tournament MVP honors as he led Sheffield to a 61-58 win over Hillcrest in the boys championship game. Washington got 27 points from Martavious Newby to win the boys consolation game against Carver, 71-55. The girls consolation game was won by Sheffield, 53-39, over Washington. Top-seeded Westwood beat River City, 80-61, in one boys semifinal game, and City University escaped Douglass, 52-50, in the other semifinal. Westwood was led by Jarvis Sullivan's 20 points. City's Joshua Howard's 10 points led a balanced attack. Westwood and City will meet in today's boys title game. ... In girls semifinals, top-seeded Douglass beat MAHS, 66-25, and No. 2 seed Westwood edged City University, 56-47. Douglass and Westwood will play in today's championship game. The Tennessee Secondary School Athletic Association (TSSAA) announced this morning its finalists for the Mr. and Miss Basketball Awards, with a strong Memphis flavor..
Two local girl players are finalists. In Class AAA, Millington's Jasmine Newsome and in D2-A Harding's Alex Black. Both girls led their teams to tournament championships this week. Newsome was named MVP in the Lady Trojans District 14-AAA tournament championship Tuesday night and Black was MVP of the Lady Lions D2-A West Region title on Monday. Recently former Houston High standout, Sarah Watkins (4), scored five points in the closing seconds as the Arkansas Razorbacks won their second straight SEC road game against South Carolina. Division 2-A West Region at Jackson Christian: 6 p.m. -- boys consolation, ECS vs. USJ. 7:30 p.m. -- boys championship, St. George's vs. Lausanne. District 14-AAA tournament at Arlington: 6 p.m. -- girls consolation, Cordova vs. Craigmont. 7:30 p.m. -- girls championship, Millington vs. Arlington. District 15-AAA tournament at Wooddale: 6 p.m. -- girls consolation, Southwind vs. Germantown. 7:30 p.m. -- boys consolation, Germantown vs. Overton. District 16-AAA tournament at Melrose: 6 p.m. -- girls championship, White Station vs. Central. 7:15 p.m. -- boys championship, White Station vs. Melrose. District 15-AA tournament at Manassas: 4:30 p.m. -- girls consolation, Northside vs. Trezevant-Frayser loser. 6 p.m. -- boys consolation, Northside vs. Manassas-Trezevant loser. District 16-AA tournament at Sheffield: 3 p.m. -- girls consolation, Sheffield vs. BTW. 4:30 p.m. -- boys consolation, Carver vs. BTW. 6 p.m. -- girls championship, Fairley vs. Hillcrest. 7:30 p.m. -- boys championship, Sheffield vs. Hillcrest. District 16-A tournament at Douglass: 3 p.m. -- girls semifinal, Westwood vs. City. 4:30 p.m. -- boys semifinal, Westwood vs. River City. 6 p.m. -- girls semifinal, Douglass vs. MAHS. 7:30 p.m. -- boys semifinal, City vs. Douglass. Remember this young lady?? This is the young lady that was attempting and dropping off 3s from half court in the Tennessee Turkey Jamm this past November at Central High school. It wasn't exactly half court but it was close to it..
Potter's House Christian Academy sophomore Antoinette Bannister recently committed to play collegiate basketball for North Carolina. Committing early isn't new for our community since our very own Lauren Avant committed to Tennessee as a 14 year old. I guess it's becoming the norm now. For Potter's House Christian Academy sophomore Antoinette Bannister, her road to committing early is more the exception than the rule. She committed to North Carolina last weekend, but the decision is several years in the making due to some extraordinary circumstances. And she made the pledge because the Tar Heels extended a scholarship offer for which she'd waited years. 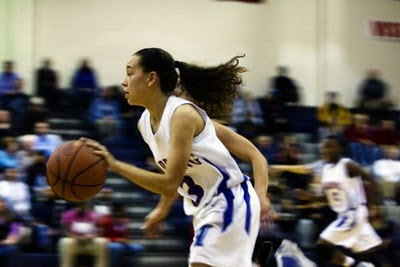 Bannister has played varsity basketball, with her father, Tony, as the head coach at Potter's House, since the sixth grade. For the most part, that is where her recruiting journey began. 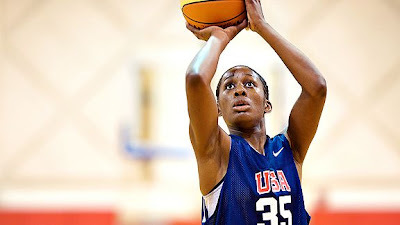 She attended the North Carolina's elite camp as a sixth-grader but played up and held her own with the high-school-aged kids. Division 2-A at Jackson Christian School, 6 p.m. — girls consolation, Fayette Academy vs. University School of Jackson. 7:30 p.m. — girls championship, Lausanne vs. Harding. District 14-AAA at Arlington, 6 p.m. — boys semifinal, Cordova vs. Raleigh-Egypt. 7:30 p.m. — boys semifinal, Craigmont vs. Bolton. District 16-AAA at Melrose, 6 p.m. — girls consolation, Mitchell vs. Whitehaven. 7:15 p.m. — boys consolation, East vs. Central. District 15-AA at Manassas, 6 p.m. — girls semifinal, Trezevant vs. Frayser. 7:30 p.m. — boys semifinal, Trezevant vs. Manassas. District 16-A at Douglass, 4:30 p.m. -- River City vs. MASE. 6 p.m. -- City vs. MAHS. 7:30 p.m. -- Douglass vs. Middle College. District 13-AAA at Dyer County, 6 p.m. -- girls consolation, Munford vs. Dyer County. 7:30 p.m. -- girls championship, Jackson North Side vs. Hardin County. Arlington sophomore Christyn Hopper converted a free throw with 11 seconds left to preserve a heart-thumping 49-47 victory over the Lady Chiefs. With Arlington ahead 43-42, Hopper banked in a 3-pointer, sank a 12-footer and converted the all-important free throw. Craigmont’s Jemil Jefferson heaved a half-court shot at the buzzer that fell short. A pair of Jasmines were the difference for the Millington Lady Trojans. Jasmine Newsome and Jasmine Prophet combined for 37 points, leading Millington to an easy 60-35 win over Cordova that propelled the Trojans to the District 14-AAA finals. The game was played at Arlington High School. Division 2-A West Region at Jackson Christian School, 6 p.m. -- ECS vs. Lausanne. 7:30 p.m. -- St. George's vs. USJ. Division 2-AA State, 6 p.m. -- BGA at Briarcrest. 7 p.m. -- St. Benedict at Brentwood Academy. District 14-AAA at Arlington, noon -- Cordova vs. Millington. 1:30 p.m. -- Raleigh-Egypt vs. Arlington. District 15-AAA at Wooddale, 4:30 p.m. -- Southwind vs. Germantown. 7:30 p.m. -- Ridgeway vs. Overton. District 16-AAA at Melrose, 6 p.m. -- White Station vs. East/Mitchell winner. 7:30 p.m. -- Central vs. Melrose. District 15-AA at Manassas, 4:30 p.m. -- Northside vs. Kingsbury. District 16-AA at Sheffield, 4:30 p.m. -- BTW vs. Hillcrest. 7:30 p.m. -- Sheffield vs. Carver. Division 2-A West Region at Jackson Christian School, 3 p.m. -- Fayette Academy vs. Lausanne. 4:30 p.m. -- Harding vs. USJ. District 14-AAA at Arlington, 3 p.m. -- Millington vs. Cordova. 4:30 p.m. -- Arlington vs. Craigmont. District 15-AAA at Wooddale, 3 p.m. -- Ridgeway vs. Germantown. 6 p.m. -- Overton vs. Southwind/Houston winner. District 16-AAA at Melrose, 3 p.m. -- White Station vs. Whitehaven/Melrose winner. 4:30 p.m. -- Central vs. Mitchell. District 15-AA at Manassas, 3 p.m. -- Manassas vs. Northside. District 16-AA at Sheffield, 3 p.m. -- Sheffield vs. Hillcrest. 6 p.m. -- Fairley vs. BTW. First of all I would like to say congratulations to all of the teams that participated in the City Championship games, Fairley, Trezevant, Central and Overton. Also, congratulations to the game MVPs Fairley senior, Erica Ousley, and Central sophomore, Danielle Ballard. This city championship series was one of the most entertaining that I can remember. At one point I thought Erica Ousley was going to score all of Fairley's points. Trezevant's junior Shervonte' Bright is probably 70% healthy and that was probably the most assertive I've seen her on offense. Fairley freshman Erica Watkins surprises me every time I see her because the growth she has displayed throughout the season. Overton's sophomore Cortrice "Big Baby" Golden might have to change her nick name because she is not playing like a baby. She is really developing into a force. Miss Aaliyah Whiteside, Central's sophomore, has come out of her shell. She is the truth. Especially during "gut check time" as we said during my Hamilton High school days. If you thought the game between Overton and Central was good last year.. This was 1000 times better plus Overtime.. In a move almost certain to be a lightning rod for debate in the already contentious world of club basketball, the Amateur Athletic Union (AAU) announced that it will implement broader resident requirements in any of its girls' basketball events that is certified by the NCAA for viewing by college coaches. The temporary move, allowing its sanctioned teams to have an unlimited number of members outside the state or district boundaries, is a dramatic departure from longtime AAU rules. The AAU previously restricted teams to a maximum of three players from a bordering district. A team's district is defined by the coach's residence. Two high-school girls' basketball players were named to the 2010 McDonald's All-American team despite questions about whether either met the game's selection criteria. One of them, Laurin Mincy, of Newark, N.J., was eliminated from consideration in a final-ballot re-vote, according to several selection-committee members, but still was named to the East squad. The "final ballot addendum," acquired by ESPN HoopGurlz, does not include three players -- Mincy, plus Whitney Bays of Huntington, W.V., and Michala Johnson of Lombard, Ill. -- who have missed most or all of their senior high-school seasons because of anterior-cruciate ligament (ACL) injuries. An email from Sports America, Inc., which organizes the McDonald's Game, informed voters that Bays, Johnson and Mincy were removed from the final ballot because of injuries. Division 2-A West Region, 7 p.m. -- Bishop Byrne at ECS. 7:30 p.m. -- St. George's at Harding. TBA -- FACS at University School of Jackson, Lausanne at Jackson Christian. District 14-AAA at Arlington, 7:30 p.m. -- Bartlett vs. Bolton. District 15-AAA, 7:30 p.m. -- Collierville at Ridgeway, Overton at Wooddale, Houston at Southwind, Kirby at Germantown. District 16-AAA, 1 p.m. -- Mitchell at East. 6 p.m. -- Whitehaven at Melrose, Hamilton at Central. District 15-AA at Manassas, 6 p.m. -- Manassas vs. Frayser. District 16-AA at Sheffield, 4:30 p.m. -- Oakhaven vs. Carver. 7:30 p.m. -- Hillcrest vs. Fairley. Division 2-AA first-round state playoffs: 7 p.m. -- Hutchison at Brentwood Academy, Harpeth Hall at St. Agnes. Division 2-A West Region, 6 p.m. -- FACS at Fayette Academy, SGIS/BB winner at Harding. 6:30 p.m. -- ECS at USJ. TBA -- JCS/SBEC winner at Lausanne. District 14-AAA at Arlington, 3 p.m. -- Cordova vs. Bolton. 4:30 p.m. -- Craigmont vs. Bartlett. 6 p.m. -- Arlington vs. Raleigh-Egypt. District 15-AAA, 6 p.m. -- Houston at Southwind, Wooddale at Ridgeway. 7:30 p.m. -- Kirby at Overton, Germantown at Collierville. District 16-AAA, 3 p.m. -- East at Mitchell, Melrose at Whitehaven. 6 p.m. -- Hamilton at White Station. District 15-AA at Manassas, 4:30 p.m. -- Kingsbury vs. Frayser. District 16-AA at Sheffield, 3 p.m. -- BTW vs. Oakhaven. 6 p.m. -- Hillcrest vs. Carver. Trailing Overton by double digits at halftime of their MIAA Class AAA city-title game Thursday night at Wooddale, Central girls basketball coach Niki Bray gave her Lady Warriors an ultimatum. "Take off your jerseys now or decide to play," said Bray, whose nationally ranked club elected to do the latter against an Overton squad that had won 23 straight contests. Rallying from a 12-point first-half hole, Central earned its second straight MIAA city title with a 70-66 overtime win over Overton, which was attempting to avenge a 65-59 loss to Central in last year's Class AAA city-title game. Central (70) -- Danielle Ballard 16, Darianne Butler 3, Alex Butler 2, Michella Carter 2, Nina Davis 18, Malaika Moore 2, Jalen O'Bannon 5, Monia Sanders 2, Aaliyah Whiteside 20. Overton (66) -- Lakeria Crowder 2, Cornelia Fondren 12, Cortrice Golden 10, Jackeya Mitchell 6, Jasmine Robinson 23, Jasmine Stafford 2, Karisma Tyson 2, Arkela Ware 9. When you have lost to a team five consecutive times, winning is even sweeter. It feels like redemption, especially when there is a championship in the mix. The Briarcrest Christian Lady Saints broke a 0-5 steak Thursday with a hard fought, 54-50, victory over St. Benedict to claim the 2-AA West regional championship. 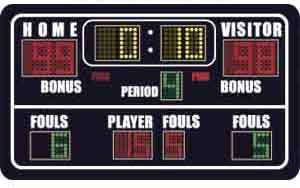 The game was played at The Ross McCain Lynn Arena on the campus of MUS. Trezevant’s girls thought they might have a couple of matchup surprises for the Fairley juggernaut Thursday in the MIAA Class AA championship at Wooddale. But like so many teams that have tried before them, the Bears discovered they had no match for Bulldogs senior Erica Ousley. Ousley scored 25 points, including two big bursts in the first and third quarters, as Fairley (24-3) took home its first city championship in its first season as a AA team with a, 56-49, triumph over Trezevant at Wooddale. There was a time when youth basketball outside the high-school season simply was called "AAU," for the Amateur Athletic Union, which runs state, regional and national level championships for kids 10-18 years old. With the explosion of women's basketball and increased awareness of the recruiting process the focus for players at high-school age is on getting exposure to college programs, not winning championships. There was a time when the teams would focus on AAU qualifiers and AAU Nationals with a team's best players going either to the Nike All-America Camp or the adidas Top Ten Camp. In the last six or seven years the youth basketball world evolved again with an influx of "national" tournaments, the dissolution of the Nike All-America Camp and the introduction of the Skills Academy concept which was successful on the boys' side of the game. At nearly the same time, adidas changed leadership with John Phillips III taking over while the Top Ten brand stayed with former adidas front man Michael White. Did you know both the head coach at Trezevant and Central have the same names? Did you know I am former team mates with both the head coach at Trezevant and Central? 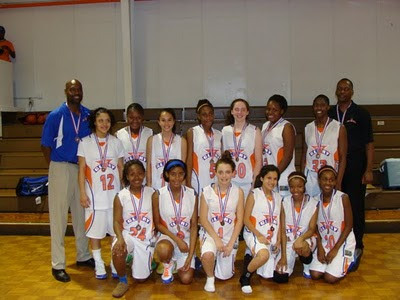 I played at Hamilton High School with Nicole Newman and with Nikki Bray at the University of Memphis. Did you know in 1994 the head coach at Trezevant played in the city championship game at Wooddale High School against East High School? Did you know Central's head coach began her high school coaching career at Wooddale High School? Overton vs. Central ---The showdown that everyone has been waiting for!!!!!!! First game should start around 3:00 p.m. (AA girls), followed at 5 p.m. (AA boys), 6:30 p.m. (AAA girls) and 8 p.m. (AAA boys). The AAU has released an AAU Girls Basketball Club Power Ranking. Several Memphis squads are represented in the ranking.